Solardome® geodesic domes are ideal for longer indoor exhibitions, short outdoor exhibitions or long-term exhibition displays. They create a unique eye-catching structure that will be sure to capture people’s attention and draw them to your stand or display. 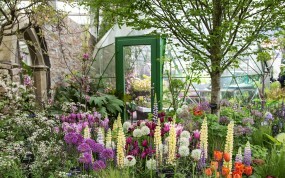 The smaller glasshouses work well for long indoor, or short outdoor exhibitions as they then do not need to be weather-proofed and can be built and dismantled quickly. They are perfect for transforming your exhibition into a unique, attention-grabbing and modern space. 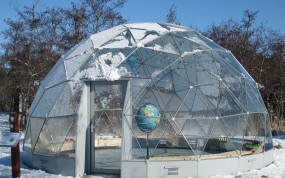 As well as our standard range of domes we can also design and manufacture bespoke domes or spheres with other types of cladding or material coverings for specific projects. Choose from our standard commercial range of aluminium and glass domes for exhibition domes 3.5m-10m diameter, or our SOLARDOME® PRO architectural system for more permanent dome projects from 10m – 25m diameter. We provided a SOLARDOME® Sanctuary (7.75m diameter dome) with extra doors for an exhibition company promoting the Canadian tourist office. 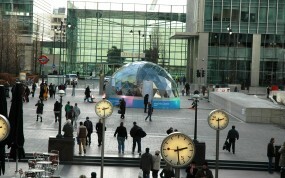 The dome was in-situ for a month outside the Canary Wharf station, London. 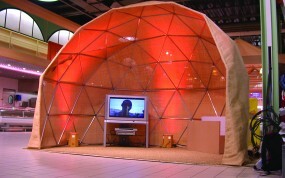 We are often asked to develop unusual dome concepts – here’s one for a ¾ dome as a central feature to an exhibition. 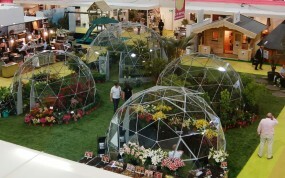 We were invited to provide the “Flower Domes” features stand at Grand Designs Live 2008 in London and Birmingham. We provided four of our unique domes- three SOLARDOME® Havens and one SOLARDOME® Retreat – to house a buzzing flower market. The Danish Forest and Nature Agency enlisted the help of Solardome Industries to create an innovative and personal way of educating young people about the challenges of climate . 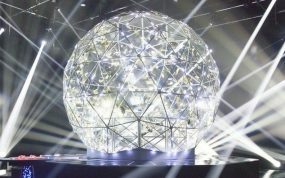 Solardome had the privilege of building the crystal dome for the revamped Crystal Maze TV series on Channel 4. It started as a wild idea, but today our house on the quay has its very own window to the world.